Nate Burkey fired a brace to lead the way for Ceres-La Salle. CERES-LA SALLE survived a late scare from Kaya FC to kick off its title-retention bid in the Philippine Football Federation-Smart Club Championship with a 3-2 victory on Thursday night at the Rizal Memorial Stadium. National pool member Nate Burkey fired a brace, while fit-again Angelo Marasigan chipped in a goal for the back-to-back champions, who established a three-goal cushion that seemed insurmountable. But Kaya, a perennial United Football League title contender, fought back behind striker Joven Bedic, who scored two goals of his own in a five-minute span late in the second half that set up the pulsating finish. The victory awarded Ceres three points, the same as Loyola Meralco, although the Sparks have the lead in Group A on goal difference following a 4-0 zapping of Laos FC in the first match. Acquired from Pachanga-Diliman last year, Burkey wasted little time in his long-awaited debut for Ceres, putting the Bacolod-based side on top in the 32nd minute with a finish from inside the box. 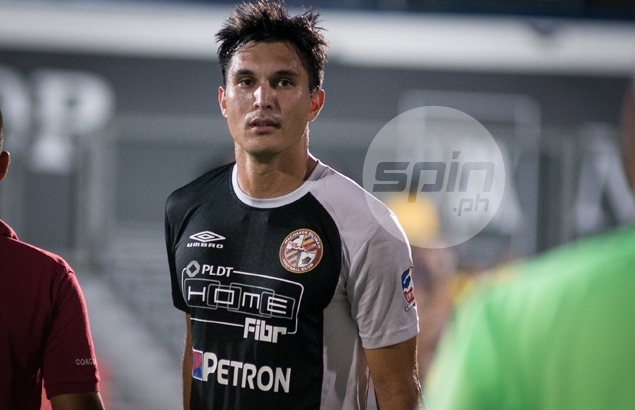 After Marasigan doubled the lead by pouncing on a weak pass from the opposition to score early in the second half in the 54th minute, Burkey delivered his second goal five minutes later. Kaya, however, refused to go down without a fight as Bedic pulled a goal back in the 77th minute with a volley over Ceres goalkeeper Michael Casas. He struck again in the 82nd when he headed home a cross from OJ Porteria. Azkals star Phil Younghusband led the way for the Sparks’ shutout victory with his own brace, while Matthew Hartmann and new acquisition Jamal Fenelon also found the back of the net.